Incredibly Simple iPhone SLR Lens Hack #celebratephotography « Adafruit Industries – Makers, hackers, artists, designers and engineers! 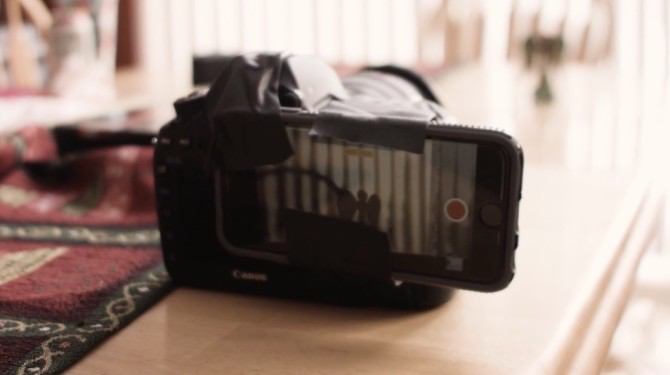 With a roll of gaffer tape, a DSLR and his iPhone, Jake built the most basic version of the adapter possible. He simply taped his iPhone to the viewfinder of his Canon DSLR and voila! Sure, you have the circular viewfinder overlay on every frame, but for $0, consider it part of the cheap-o aesthetic. Watch the video to see some footage captured with the rig.